Time Magazine called him, The Man With America’s Trust — Walter Cronkite, of course. His recent death following his 70-year career in journalism and broadcasting has given the world an opportunity to examine, and even reassess, a value central to the Code of Chivalry: trust. 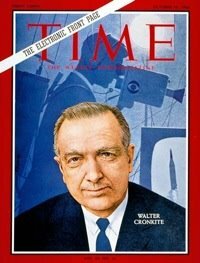 Cronkite was voted (in a 1972 public opinion poll) “the most trusted man in America.” The many obituaries and retrospectives that followed his death paint him as the very image of a modern knight: honest, brave, competitive and humble — implying that, on some level, it was the principles of chivalry that earned the trust of his listeners and viewers. Yet amid the fond memories and professional analyses, there are commentators who regard “trust” (like “chivalry”) as a relic of a bygone age — something that has outlived its relevance, and would be best left in the era of automotive tailfins and big-band orchestras. Some see the very idea of a “most trusted” person in America as a reflection of bias, gullibility and naiveté among the public. Slate Magazine, in a piece titled, Why I Didn’t Trust Cronkite, postulated that the age of journalistic trustworthiness stemmed from an FCC policy (discontinued in 1987) mandating that both sides of controversial issues had to be given equal time on the air. “One way around (the policy)” Slate explains, “was to tamp down controversy.” They dismissively speculate that Cronkite’s trustworthiness was a result of blandness rather than integrity. Other news sources took a different angle in their critique of trust by seeking to quantify the concept in scientific terms, distilling trust to nothing more than a behavioral response to sensory stimuli. A symmetrical face and a deep, resonant voice are both indicators that elicit a sense of trust in most people, and perhaps there was no more to Cronkite’s trustworthiness than that (at least according to a report put out by PR firm Decker Communications, coaching business executives on how to polish their “brand” by looking and sounding trustworthy). Of course, in today’s society, which seems to be weathering a veritable hailstorm of corruption and scandal, trust is (understandably) in short supply. But abandoning trust merely because the concept has been abused is a bit like junking your car just because it’s in need of a tune-up. The cynical voices calling for the obsolescence or commercialization of trust point to a critical misunderstanding of the concept: the difference between trust that is given and trust that is earned. Trusting someone blindly — be it a reporter, an officer, a politician or a lending agent — can be a recipe for disaster. This is undoubtedly why writings about chivalry from medieval literature emphasize the importance of intelligence and discretion among the qualities of a knight. Knights were expected to be discerning and self-sufficient, not to merely take someone else’s word about what was right and wrong. Yet at the same time a knight was expected to act in a manner that was faithful and reliable. There was hardly anyone more deplorable in medieval society than a knight who broke his word or swore a false oath. It is a very potent statement. Arthur doesn’t cite a lack of charity, justice or valor as the downfall of his knights. For him, it’s not until trust is eroded that the Round Table is finally doomed, and his words remind us that when there’s no one or nothing left to trust, it’s every man for himself. Building trust, of course, takes time — and time like that isn’t easy to come by in today’s world. Trust is not a virtue of a single, grand gesture, but an ideal for the long haul. Yet, like chivalry, trust and trustworthiness are goals worth working for. Cronkite might have been the “most trusted person in America,” but he wasn’t the “last trusted person.” Even in a skeptical, cynical age, he stands tall as an example of trustworthiness, intelligence and chivalry that everyone can (and should) aspire to.